Learn the Total Hip replacement: Exeter femoral stem and Tritanium acetabular component (Stryker) surgical technique with step by step instructions on OrthOracle. 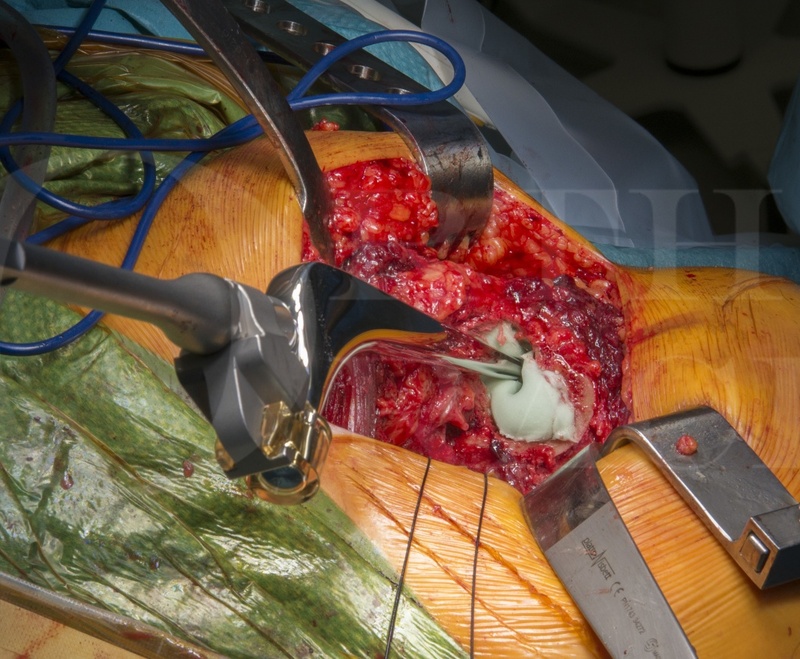 Our e-learning platform contains high resolution images and a certified CME of the Total Hip replacement: Exeter femoral stem and Tritanium acetabular component (Stryker) surgical procedure. The combination of a cemented stem and an uncemented cup is commonly know as a hybrid hip replacement due to the use of two fixation modes. The Stryker system allows for the use of ceramic or metal heads on either a ceramic or polyethylene liner. Ceramic on modern polyethylene has excellent survivorship and using a polyethylene liner allows for neutral or elevated acetabular options whereas a ceramic liner is only manufactured in a neutral version. Such elevated acetabular rim liners may be used to facilitate improved stability of the hip replacement. The Exeter cemented stem has excellent survivorship, reported as 100% at 17 years (Carrington et al), and is a polished, double tapered cemented stem which has an ODEP* 13A star rating. The Tritanium acetabular component is an uncemented shell with modular liner options and is 7A star rated by ODEP. It can be solid backed or cluster hole in design, allowing additional screw fixation as desired. The acetabular liner can be either ceramic or polyethylene, dual mobility and capture liner options also exist. The Tritanium cup has a highly porous titanium based surface which allows for high primary frictional stability immediately following implantation followed by bone ingrowth for biological fixation. Such a combination can be used in any aged patient, however consideration should also be given to a cemented cup in the more elderly patient. The national joint database of England, Wales and Northern Ireland details excellent survivorship data on this ceramic on polyethylene combination. The Exeter Universal cemented femoral component at 15 to 17 years. Carrington N, Sierra R, Gie G, Hubble M, Timperley A, Howell J. Journal of Bone and Joint Surgery, (2009); 91-B:730-7. *ODEP – Orthopaedic data evaluation panel is a system where orthopaedic implants are rated on their survivorship by an expert panel. The number refers to the number of years of evidence and the letter the to the strength of the evidence provided. See http://www.odep.org.uk/Products.aspx for further information. Institution : The Avon Orthopaedic Centre, Bristol, UK.